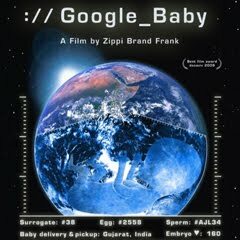 Wealthy Americans and Europeans, gay or straight, can now shop online for an egg from an egg donor in the West, use their sperm or from sperm another western donor, and implant the embryo into a surrogate mother in India. These people don't want their European genes to be mixed with those of the poor women in India, but the Indian women are acceptable as cheap surrogate mothers. "CONAN: And essentially your film follows a young man from Israel who has been -he and his partner have adopted a baby, has gotten a surrogate baby themselves from the United States. And he says in the end it ended up costing him $140,000. And he thinks, wait a minute, everything else is being outsourced to India. Why not this? Ms. FRANK: Exactly. That's what - that's exactly his start-up(ph). I mean he did it - he did his first baby through 100 - he paid 140,000 U.S. dollars and he decided he's going to find the cheapest way to do the other babies. And now his business is really growing rapidly, I would say. And it costs, if you go to India and you still want to have a Western egg donor but you can, you know, you can compromise for an Indian surrogate mother, so you pay only 40,000 U.S. dollars, and that's the maximum you can get for a baby." The NPR radio show featured a couple of soundbites from an Indian obstetrician Dr. Nayna Patel in Anand, Gujarat, who is actively promoting her India-based surrogacy business in the West. "Dr. NAYNA H. PATEL (Akanksha Infertility Clinic): Hello? Yes. I'm so sorry, Doctor, but you know it's not an easy procedure. It's a very complicated procedure, surrogacy, and they should understand all the implications before they go into it. Yeah? So that - yes. The husband and wife themselves should come, understand the whole procedure, and then decide whether they would want to go for it or not, okay? When they come personally we can discuss it, okay? Okay. Welcome. Bye-bye. No, no, no, most welcome. Bye-bye." "Dr. PATEL: I am Dr. Nayna Patel, and I'm practicing in vitro fertilization (unintelligible) in Gujarat, India. And (unintelligible) started practicing surrogacy. And these are a few of my surrogates who work with me. All of my surrogates are very humble, simple, nice females. And they are very committed, they are very dedicated, they're very religious. And they want to do their job in a very dedicated manner. These surrogates are (unintelligible) and they always deliver under my care and supervision. And this, as a clinic, we try to supervise as a whole procedure." Dr. Nayna Patel's IVF and cheap surrogacy business has dramatically picked up since her appearance on Oprah Winfrey Show back in 2006. It is common in the United States for IVF children to know and maintain contact with their surrogate birth mothers. However, the poor Indian mothers do not want to acknowledge their surrogate status in public, nor do they want any connection with the babies they carry to term because of social taboos. Critics argue that the surrogacy practice in India is not only exploitation of poor women, but it is also a violation of the UN Convention on the Rights of the Child which states that all children have a right to know their parents.